About half of all Afghans live in a district outside the full control of the government in Kabul, according to an analysis of Afghanistan’s population data, yet another metric pointing to the inability of U.S.-backed Afghan security forces to roll back the Taliban insurgency. The assessment comes in a report published Monday by the Long War Journal, a news and analysis website associated with the Foundation for the Defense of Democracies. Using the U.S. military’s Afghan population figures, authors Bill Roggio and Alexandra Gutowski determined that 41 percent of Afghans reside in a district contested by the Taliban, while about 9 percent live in Taliban-controlled district. 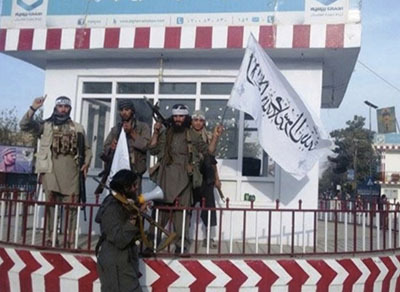 In an image released by a Taliban spokesman on Twitter, militants display their flag at the center of Kunduz, Afghanistan, when they briefly captured the city in the fall of 2015. The Long War Journal analysis describes Afghan provincial districts in one of three ways: government-controlled, contested and Taliban-controlled. According to this classification scheme, 13.4 million Afghans are living in contested areas where they have varying levels of contact with Taliban insurgents. 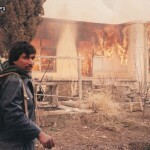 Another 3 million live where the Taliban exercises control over local governance. The Pentagon uses more categories to describe the status of Afghan districts, which leads to a slightly different picture of how much of the Afghan population is under threat from the Taliban insurgency. Notably, the military distinguishes between “contested” districts and areas under government “influence.” That distinction allows it to assert that just 24 percent of the population lives in a contested district, well below the Long War Journal’s assessment. Since then, Afghan security forces have in fact lost ground to the Taliban in terms of the number of Afghans living under each side’s control, according to the Special Inspector General for Afghanistan Reconstruction (SIGAR). “Since SIGAR began receiving population-control data in August 2016, the overall trend has been a decrease in the percentage of the Afghan population living in areas under government control or influence (by about four percentage points), fluctuation in the population living in contested areas (from roughly 23 percent to 29 percent), and an increase in percentage living in areas under insurgent control or influence (by about three points),” the agency wrote in its latest quarterly report in July. The growing number of Afghans living in contested or Taliban-controlled districts comes amid a particularly bloody year for Afghan security forces and civilians alike. Taliban fighters completely destroyed several Afghan army units and nearly managed to wrest control of a key provincial capital away from the government during the summer fighting season. By mid year, about 1,700 civilians had been killed in the fighting, putting 2018 on pace for the deadliest year for noncombatants in Afghanistan since 2009. The Taliban has benefited from the coalition’s strategy of ceding rural territory to insurgents while consolidating forces in more densely populated areas, according to Roggio and Gutowski. Patient statistics shared by Emergency War and Trauma Hospital show that there was a 10 percent increase in war casualties in 2016 as compared to 2015. "It has doubled in the last five years," Panic explained.